Communication is vital on a construction site to ensure the safety of all workers. When some employees are not as confident with English, it is important to take appropriate steps to ease communication as much as possible. The site introduced a language improvement card for those identified at induction as having poor English language skills. The individuals are assisted by an interpreter who is charged with providing 2 x 15 minutes speaking English sessions to assist the inducted person learn the phrases on the card over a period of approximately 4 weeks. The site safety/fire plan includes the card as a tool for use by fire marshals/site managers making a sweep of a building to ensure they are able to communicate with the whole of the workforce without the need of a translator, particularly if they encounter a lone worker situation. 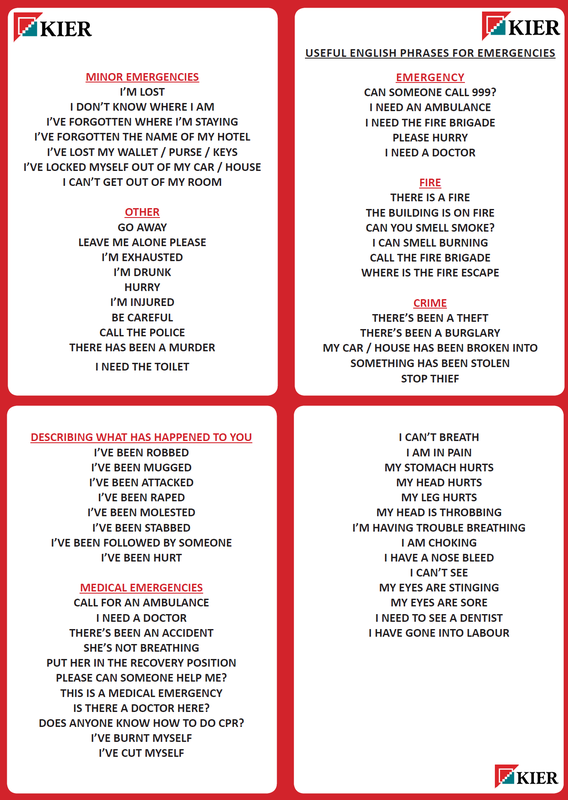 All fire marshals/site managers are familiar with the card but also carry a copy with them. This initiative will assist those with limited language skills to gain confidence to further learn the language. Monitor report. Kier Construction. London. January 2018.